The technological transformations that we have witnessed in recent years have the potential of producing enormous gains in terms of life quality. 1 The growth in artificial intelligence (AI) and virtual reality (VR) developments have broadened their application possibilities in our daily lives: in work, health, consumption, and recreation to name only a few. In this employment model, internet based platforms connect providers and consumers of almost any service. Matched services include those provided by lower and higher skilled profiles, from domestic workers to business consultants and computer programmers. The only requirements are computers and WiFi access anywhere in the world 1) to use an internet based app or platform which matches supply and demand and 2) to complete the tasks offered. 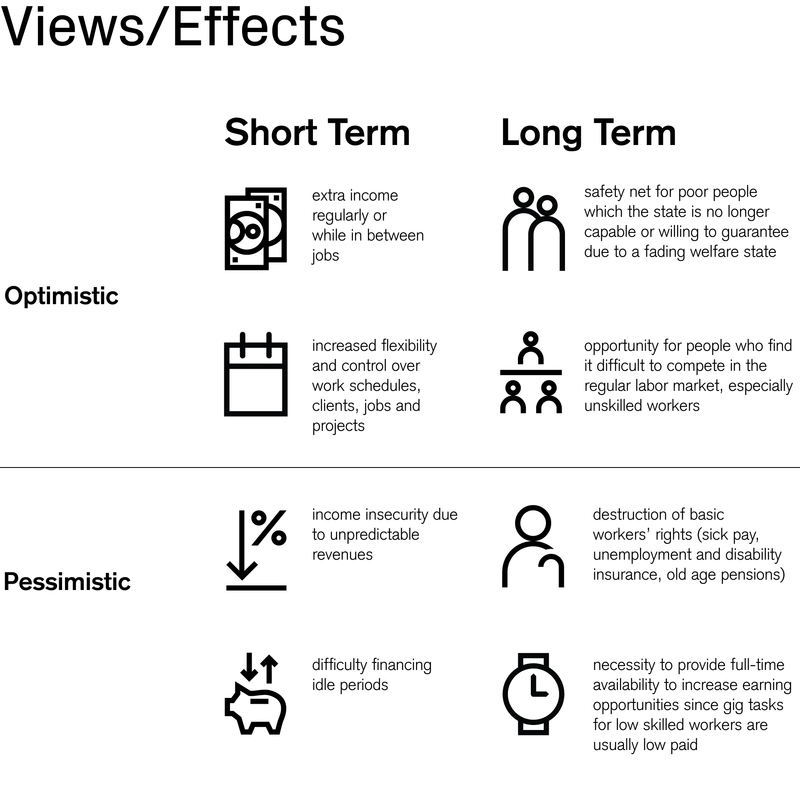 The latest publication by our Credit Suisse Research Institute (CSRI), AI & The Future of Work, assesses the impacts this groundbreaking approach is having in the job market and social environment. The authors explore the various ways this compelling phenomenon is swaying such established structures in previously unimaginable ways. As most disruptive technological innovations, the gig working model is both an opportunity and a threat to the social environment, bringing governments new challenges in developing the adequate legislation to address the needs of all involved. In this innovative working model, companies have the ability to hire best matching skills only when needed, without having to offer more than a payment for the service provided. A cost efficient method without a future commitment. The gig economy is still a minimal percentage of total employment. Nonetheless, its significance is undeniable given that its vast potential is amplifying its rapid global growth. Finding a balance between flexibility and security is therefore impertinent for legislators, companies, and employees. Innovative solutions in public policy are required to ensure that society as a whole can profit inclusively and impacting uncertainties are reduced. There is, however, one contemporary certainty stemming from the gig economy: the need to solve its inherent dilemmas is now fomenting ingenious regulation and political debates. Is active Greater job opportunities or social threat? Assessing economic security in the gig economy.